Does NwBestCPR provide on-site training? Our favorite answer is YES! We travel to workplaces, not-for-profit organizations, schools, places of worship, community groups and even private families for as few as 5 people. We highly recommend you have as many of your staff trained as possible and we work with you to customize each training to your specific needs. Larger classes are more stimulating, allow everyone the opportunity to train as a team, and lowers the per person cost. Does NwBestCPR offer evening or weekend classes? We conduct local classes on weekends and evenings and offer convenient scheduling for businesses. We work when you need us! Hosting a training at your business is a wonderful community service your company can also offer your patrons. Does NwBestCPR offer classes for individuals? YES! ​How young can participants be? We've trained students as young as 7 and find they learn very well if they can be attentive and actively participate. Our instructors know how to keep kids engaged! Should we bring anything to class? NW Best CPR and First Aid classes are active and engaging so you may not even have time to take notes. Please wear comfortable clothes which allow freedom of movement and the ability to get down on your knees. If you have injuries or chronic pain, your instructor will help you perform CPR in a comfortable manner...just ask for help! He's smiling...He must be breathing. When do we receive our course completion cards? Course completion cards are sent by email within 48 hours class. Are we required to purchase course manuals? Course materials are available for purchase from an independent third party. Links are provided on each course description page. We strongly suggest BLS for Healthcare Provider students purchase and review the study materials well before class. Enrollment cancellations received with less than 48-hour notice are only refunded when another client fills your reservation. Your tuition may be applied to an available class with a $25 transfer fee. Note: If you purchased your class thru CourseHorse, then our Refund & Cancellation policy applies to your purchase. If you are entitled to a refund, or have any questions, please visit the CourseHorse site and contact their customer service team. 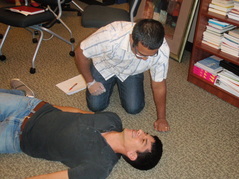 BLS - CPR for Healthcare Providers, and Wilderness First Aid courses may have a written exam. You will be well prepared by the time you take it. First Aid and CPR classes DO NOT have written exams. We recognize this is code for: "We've had this class every two years, will you please condense it?" Please consider CPR and First Aid instruction is about saving lives and practicing the most effective new procedures for critical times when your timely use of equipment and correct techniques may be the difference between life and death. Our classes are highly engaging and we always adjust class time to student's skills and performance levels. Can we eat during class? Sure, anytime you aren't too busy pumping on a manikin's chest or bandaging a co-worker. We take at least one quick break during all classes. What is the difference between standard CPR/AED and BLS For Healthcare Provider CPR? CPR/AED certification is for lay people and community members. Basic Life Support for Healthcare Providers is an advanced CPR class designed for medical professionals and professional rescuers. For workplaces, unless you specify you require BLS - Healthcare Provider CPR certification, you will receive information and a quote for basic CPR classes. Bloodborne Pathogens / HIV: 40 min. BLS for Healthcare Providers: 3.5 hrs. First Aid only: 2.5 hrs. Can we arrange a First Aid ONLY class or a CPR ONLY class? Sure, we can offer you exactly the training you need. If you already have First Aid or CPR and don't need the other we will customize your class. Do you teach CPR for Health Care Providers? We specialize in teaching BLS for Healthcare Providers . We also customize classes for medical and dental offices so your entire staff can learn to function as a critical care team and provide professional rescue until EMS arrives. Healthcare professionals include doctors, dentists, nurses, EMTs, volunteer firefighters, CNA's, LMT's, midwives, and physical therapists. If you are unsure of which class you need, please consult with your employer, school or licensing board. Our affiliate offers ACLS - Advanced Cardiac Life Support . We do not currently offer PALS - Pediatric Advanced Life Support. How long will certification be valid? All certification cards are now valid for two years. Bloodborne Pathogens (BBP/HIV) should be renewed annually. Do you teach how to use an AED - Automated External Defibrillator? Yes - AED use is now a standard and critical component of ALL CPR classes and we provide in-depth training in their use. Yes - AED's are now industry-wide safety equipment and available in public spaces. Our instructors will focus on the critical use of an AED in the first few minutes of Sudden Cardiac Arrest (SCA). Because we highly recommend all businesses have access to an AED, we offer an "AED Care and Maintenance" package along with High-Performance CPR training to help businesses own and maintain an AED on premises. NwBestCPR offers classes through the American Heart Association, Red Cross as well as other training entities. NwBestCPR classes are widely recognized as the most up-to-date and professional training, incorporating current science and rescue protocols endorsed by national training associations and science standards. All of our courses also meet and comply with OSHA and WISHA standards as well as federal and state laws for workplace training. Please be advised that American Heart Association now charges additional fees for their course completion cards. Click here for details. I've seen online courses in CPR, are they professional and accepted? While online courses may provide an introduction to course content, CPR (cardio-pulmonary resuscitation) is a motor skill, not just a cognitive skill. Few people would choose to learn to ride a bike or play a sport only by watching an online video. CPR requires physical practice and repetition to learn effective techniques and to practice cooperation with other rescuers. Most agencies and employers will not accept online-only training. Some online courses are considered to be scams. What if I already completed an online course? If you successfully completed an on-line course you still need to be tested by an instructor to finalize your certification. Please be highly suspicious of any organization suggesting you can complete a CPR training entirely online. We provide independent skills check appointments to complete your online course. You will be given up to 1 hour of one on one training time with an instructor. I see you offer skills checks - What is a skills check and why is it less than other classes? We work hard to offer the most affordable prices on the highest quality training for you. Skills checks are for people who have already paid for and completed an online course with another vendor and now require an AHA instructor to critique and evaluate their skills. Most employers will not accept online training without a valid skills check. We do not recommend online training for many reasons. The combination of online training followed by a skills check typically costs you more to complete, offers much less practical experience, and some online resources are actually scams; however, as a service to all our clients we do accommodate skills checks if you have already completed a legitimate online course and have the completion certificate. Do you accommodate special needs and requests? We are happy to customize each training to the needs of your employees, your workplace, and your clientele, within our capability to do so. We are not able to adjust scheduled class times to allow for English translation but are happy to create specialized classes at special rates accessible for groups of non-English speakers. We do have Spanish speaking instructors. Our instructors should be able to adjust for any special physical needs. Please let us know how we can help you learn! Contact Us for a competitive quote for your workplace today. Don't be afraid to ask for special treatment! We gladly match or beat any competitive offer.